Scabby skin rash problem on chest. I have this wierd skin rash since I was very young, about two months old and now I am thirteen years old. The rash appears mostly during the winter months and it turns into scabs. It is very irritating and when I pick the scabs off of my skin a liquid oozes out if I squeeze the affected skin area. The image that I have included shows the scabby parts on my chest. 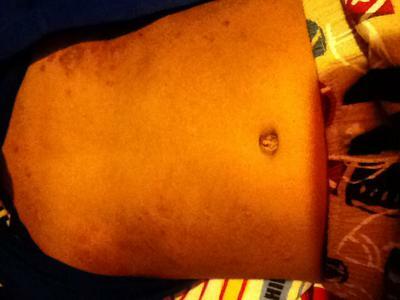 Then there are these little red dots on my stomach and they hurt when I scratch them sometimes. They are the mini version of the rash on my chest. Fortunately, this scabby rash does not show up on the visible parts of my body like my arms, face, and legs. It's all contained to the skin areas mostly covered by my clothes. Please help me. It is very hard for me as a teenager to have this skin condition and it is very embarrassing. When it goes away, sometimes it leaves these little black spots and they are all over the middle part of my body. The rash is mostly on the front part of my body. PLEASE help me find a cure for this scabby rash problem as it would mean a lot to me to get a diagnosis and a treatment so that it can be cured.